This is an ivory mirror back, depicting the God of Love and a Couple, made in Paris, in about 1300-1320. The majority of the ivory mirror cases and their leather boxes must have been purchased as expensive gifts, to be presented by the wealthy élite to their friends, family and lovers, and often as wedding presents. The subject matter of the mirror backs was almost exclusively secular. 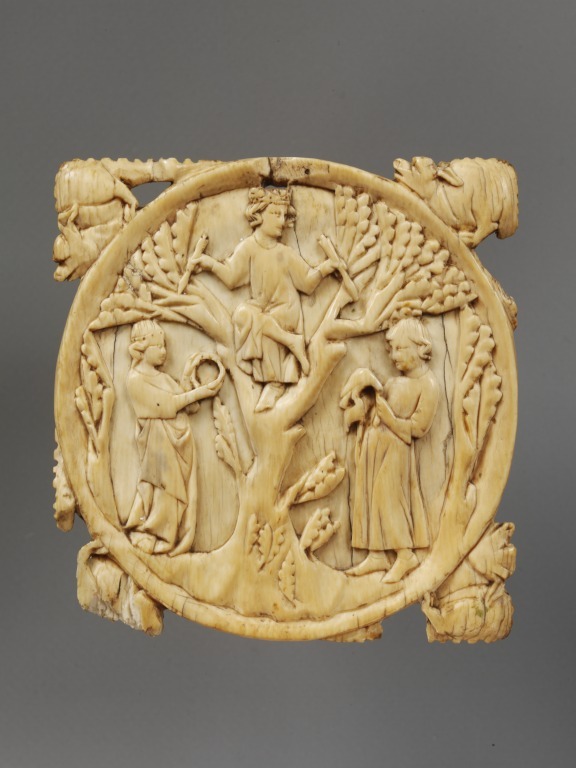 The God of Love appears regularly on ivory mirror backs, often pictured in the branches of a tree, like in the present piece. 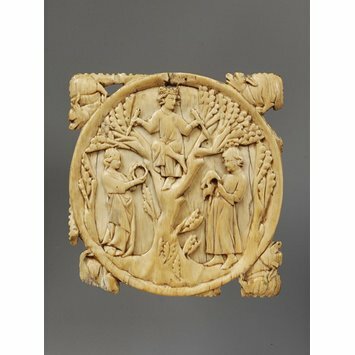 The scene depicts the crowned God of Love, seated among the branches of a tree, with his legs crossed, holding two arrows which he points at two lovers standing below, to his right, a lady holding a chaplet, and to his left a gentleman holding a hawk. These are traditional symbols of amour courtois. The corner terminals of the ivory are formed by four crawling monsters with long ears and tails. In the possession of John Webb, London, by 1862 (London 1862, cat. no. 137); purchased from Webb in 1867, for £35.